National departments are subject to annual auditing by the Auditor-General of South Africa (AGSA), where an audit opinion is given based on a department's financial statements. In forming an audit opinion, AGSA determines the financial health of departments and if its performance met its predetermined objectives and if the financial statements comply with legislation. instability caused by vacancies in key positions. 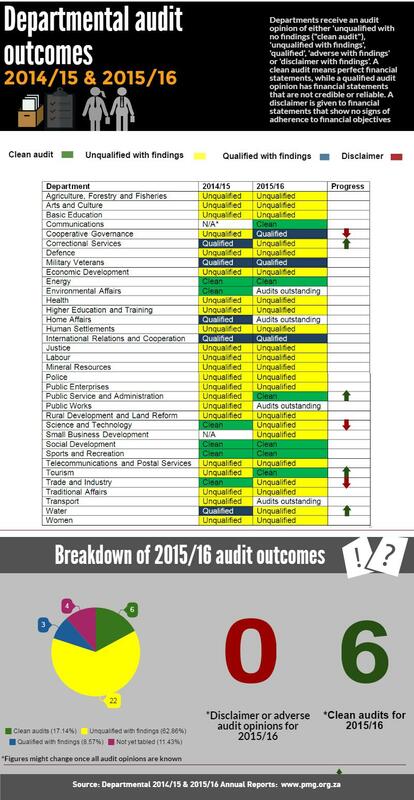 *At the time of this publication audits for the Departments of Environmental Affairs, Home Affairs, Transport and Public Works were still outstanding.